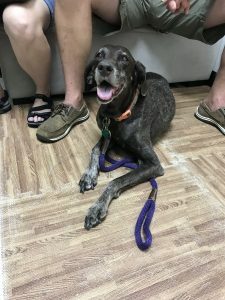 Say hello to this beautiful 14 year old pointer named Daisy! Daisy came to see us just a few short weeks ago due to shaking, knuckling, and dragging in her back legs. What that means is that her back two legs had started to lag when going for walks or even just motoring around the house. Come to find out Daisy had started to slow down more recently and we weren’t really sure why, and her parents were told an MRI may be in order because it could be something neurological. While that is not incorrect, we thought perhaps her issues were more of a structural nature and her folks decided to give us a go. Daisy had very slow response time in both her hind legs when flipping her paw over. In a normal situation, she should instantly turn her paw to “right” itself as opposed to letting it stay curled under. She was taking several seconds to realize that her paws were in a wrong position. She also had a significant hunch in her midback that her parents recalled developing over the last year or so. All of these things are not uncommon as our pets age. The good news is that often times chiropractic can really help alleviate some of the pressure being placed on the spinal cord, which in turn may be altering the communication between the brain and body. This was exactly the situation with Daisy. Her roached up mid back was increasing pressure on her spinal cord, causing inflammation and leading to delays in communication and altered nerve interaction. After two adjustments her hunch was notably decreased and she no longer had a delay in her knuckling response. The dragging had stopped and our girl suddenly had that pep in her step back. Daisy has now seen us four times and she is 100% back to herself. We look forward to helping this girl hang around for several more years to come!